The B A Start estate has been decked out in holiday fashion. Where one finds dead twigs during ordinary time, one now finds dead twigs with dead berries on them. We’ve got a spindly, skellington-looking tree the branches of which can barely withstand the weight of our ornaments. The presents are uniformly wrapped and stacked for maximum photo-opportunitousity. A few miniature santa hats, positively garish by comparison are relegated to the distant bedroom, far from the eyes of house-guests and mail-carriers. 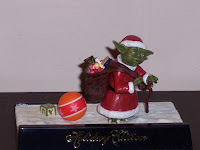 And then there’s Yoda Claus. This entry was posted in Uncategorized on December 8, 2007 by gala5931.